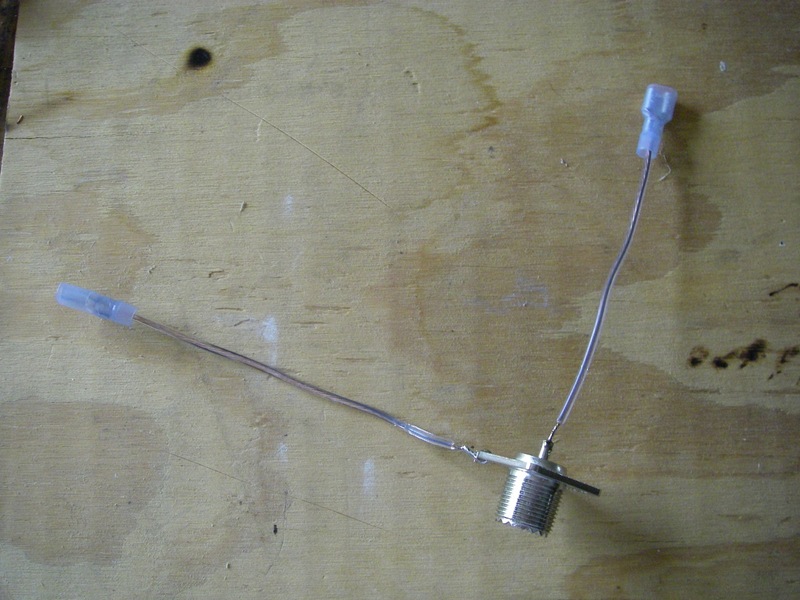 I earlier posted about building a home-brew Buddistick antenna from the instructions posted by Budd Drummond. I posted the link to his site and instructions in the previous post. Look in the sidebar to the right for a quick way to the last post. I delayed working on the antenna as I did not have a power supply for my radio so I was in no hurry. Well the power supply showed up this last Friday so Saturday morning, I was determined to finish the antenna and get on the air. The first this I did was finish wrapping the coils and crimp the Radio Shack connectors to the ends of the wires. Next came long nut coupler which the antenna whip will screw into. 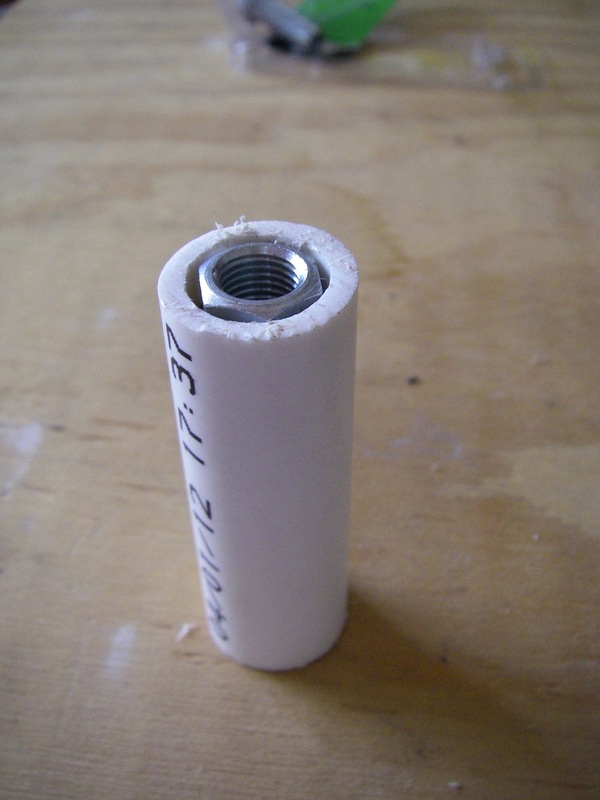 A bolt is screwed into the nut coupler and the inserted into a small piece of PVC pipe. The nut coupler was a bit small so I made up the difference with a few wraps of electrical tape as Budd suggested in his instructions. Next came the short piece of wire with a clip and ring terminal on each end. 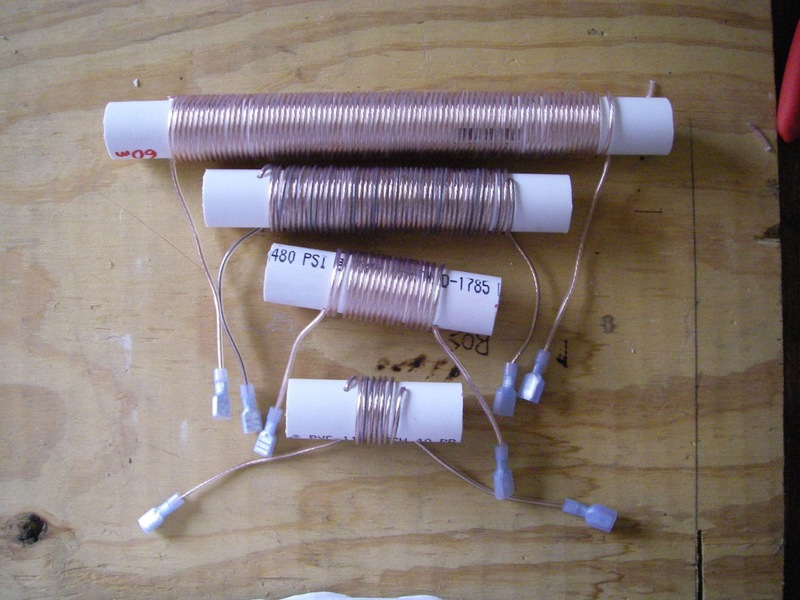 This is used to connect the top of a coil with the base of the antenna. I bought a nice piece of RG-8X coax that had PL-259’s on each end. The instructions call for dividing the coax into the shield and center section and attach a Radio Shack clip to each of those. Well I spent a fair amount of money on this cable and did not really want to cut one of the connectors off the cable. I thought it would be nice to have some sort of adapter so I could use different lengths of cable over time if needed. 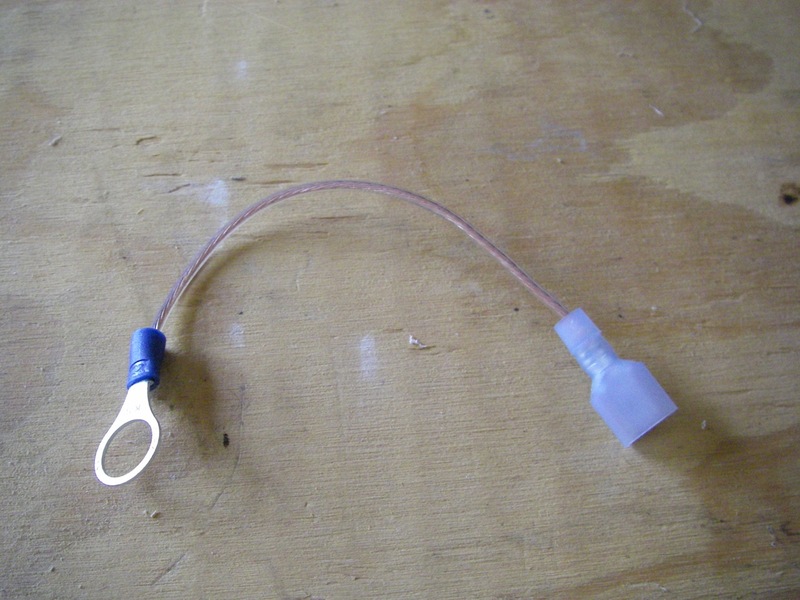 This would allow me to have standard sections of cable with PL-259 connectors on the ends and be more versatile in the long run without having a cable dedicated to this antenna. To solve that problem, I came up with this little thing. It is simply a chassis mount for a PL-259. I soldered two small wires to the center and outer portion of the mount and then added the blue clips. The center wire goes to the bottom of the vertical portion of the antenna, and the wire coming off the outer part of the chassis mount goes to the radial wire. I used different male/female connectors to avoid being able to connect it wrong so if I start making connections at the top near the whip and work down. Now I can simply attach a PL-259 to this “adapter”. I do plan on putting this little thing in a little box or somehow protecting it somehow. I might post what I come up with later. 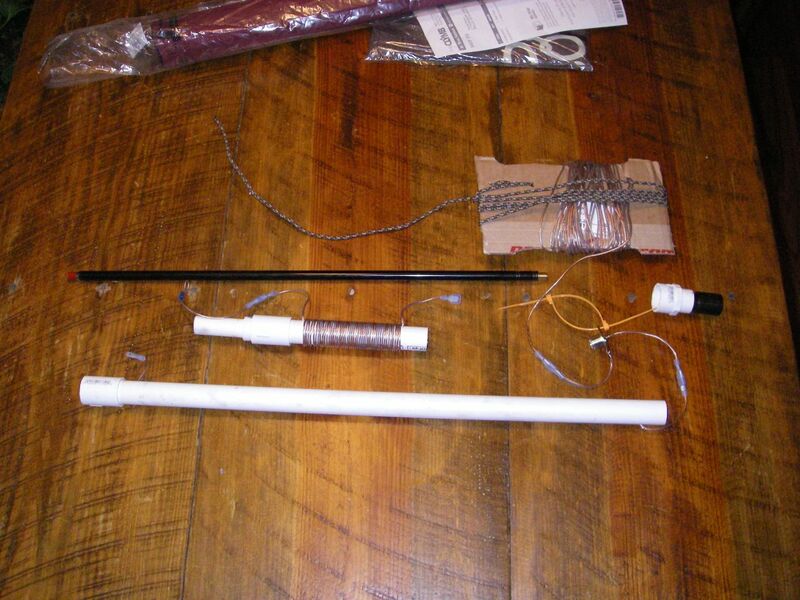 Here is the completed antenna without the broom stick that holds it up. I am going to get a painter’s pole from the local home store soon so I can get it up higher than the broom stick. I also am planning on getting a few tent stakes and parachute cord so I can guy it and make it self-standing if there is nothing available to secure the painters pole to. So far I have had good performance with the antenna. I don’t have an antenna analyzer so I used an SWR meter and got the SWR as low as I could by adjusting the radial that I tied off to my fence across the yard. On 20 meters, I heard stations from both the east and west coast of the US along with scattered stations in between. I also heard Mexico, Canada, and a station in Istanbul, Turkey! I made a few contacts around the country and in Mexico. The guy in Turkey had a huge pile up so I didn’t get to work him. Considering this was the first time I have ever been on HF, I am sure there will be other chances. I then tried 40 meters. Again using the SWR meter I adjusted the radial to get the lowest reading and went to work. Again I had good results hearing stations around the country. I have yet to try any other bands yet but I will at some point in the future. I may post a part 3 later if I learn something more about its use. . . . I would like to post a picture of it setup but it’s raining today. Maybe I’ll add that in the near future. I also need to get a real kite winder for the radial wire as I doubt the cardboard will last very long. I also am planning on getting liquid electrical tape to finish things off a little nicer. And the last thing is to try to mount the chassis adapter maybe in a little box or something better than just hanging it with zip ties. NOTE: I have decided to add a 80 meter coil and lengthen the counter poise. I’ll add a post about those results when I am done.